Once one of the more formidable submarine hunters in the world, the CP-140 Aurora has since Operation Unified Protector over Libya in 2011 also become one of the premier intelligence, surveillance and reconnaissance (ISR) platforms in coalition operations. The six CF-188s may be the focus of much of the media attention on Operation Impact in Iraq and Syria – and rightly so, with over 700 sorties flown since they were first deployed in late October – but it is the Aurora that often provides the critical ISR and targeting data. Over the past 15 years, the CP-140 has undergone a series of upgrades to its various systems as part of the Aurora Incremental Modernization Program (AIMP), but none was brought into service on such short notice as the recently added interim beyond-line-of-sight (iBLOS) satellite communications system that allows the aircraft to securely stream data, including full motion video, at high speeds to anywhere in the world. During the 2015 Air Force Outlook and at media briefings on Op Impact, commanders have repeatedly sung its praises, as well as how it was introduced. It’s a capability that Lieutenant-General Yvan Blondin, the retiring commander of the RCAF, had been championing for some time. In January 2013, a CP-140 equipped with an L-3 Electronic Systems Services BLOS system accomplished what no other RCAF aircraft had ever done before, successfully streaming live video from just below 80 degrees in the Arctic to 14 Wing in Greenwood, a distance of nearly 4,000 kilometres. So when the air force was given orders to assemble a task force for Op Impact last October, Blondin immediately called IMP Aerospace, the prime contractor on the AIMP, for help acquiring and integrating an iBLOS SATCOM system. By December, the first of three aircraft equipped with the capability was conducting operations as part of Joint Task Force-Iraq. “This new capability wasn’t expected to come online for several years but was fast-tracked given our mission,” Lieutenant-General Guy Thibault, Vice Chief of the Defence Staff, said at an event in Ottawa. Tom Galley is executive vice-president of IMP Aerospace and has been involved with the Aurora program in some manner since he joined the company in 1982. He says the fast-track nature of the project was unusual but “it was a case where everybody was brought online very quickly and worked in an extremely cooperative manner. Within a few weeks [of the call from LGen Blondin], we were into serious discussions about design concepts and contractual details.” From a kickoff meeting with DND and L-3 ESS in early October, the first aircraft was inducted in early November and delivered by mid-December. “You don’t see that happen too much nowadays,” he said. Were it not for the ongoing modernization program, however, integrating ViaSat’s VR-12 Ku/Ka dual-band communications system would not have been possible, Galley acknowledged. Under the AIMP, the capability of 14 Auroras has been upgraded in three successive blocks. The first, completed in the early 2000s, brought all of the aircraft up to what Galley calls a “consistent configuration” of technology so they could accept more sophisticated modifications. Block 2, “the meaty phase,” included navigation and flight instruments as well as communications management and radar, all of which required extensive rewiring of the aircraft. Block 3 has delivered the “heart of the mission architecture,” and included new sensors and a data management system which Galley says “has really changed the brains of the aircraft.” (A fourth block is currently in definition and would make permanent wideband SATCOM and add capabilities like Link 16 data exchange network access and infra-red counter measures). For Blondin, the quick reaction capability program to deliver the iBLOS system is a demonstration of how well the procurement system can function when the requirement is urgent. 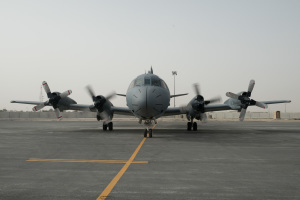 But it is also a reminder that while the CP-140’s surveillance capability is almost unmatched – and it can now transmit that data at 10 megabytes per second to analysts anywhere on the ground or make assessments from the aircraft itself – it is a much costlier platform to operate than an unmanned aerial system (UAS). At an event in Ottawa, Blondin expressed frustration with the pace of the procurement system. The human analytical power onboard the CP-140 might demonstrate a capability that is superior to a UAS, but he nonetheless needs the on-station persistence promised by the Joint Unmanned Surveillance Target Acquisition System (JUSTAS), a project that has been exploring options for a decade. For now, though, iBLOS is setting a new standard for the RCAF. And because of a collaborative effort, IMP, ViaSat, L-3, and the department were able to not only deliver three aircraft in under 90 days, but even provide the third a week ahead of schedule. Amazing stuff. We will also give Indonesia $578 million this finnacial year in foreign aid. We spend 10% of GDP on health, Indonesia 2.4%. Education 2.8%and Australia 7 %.Over all Foreign Aid will rise from $4.8 billion in 2011 to $7.8 billion by 2015-16, with the Indonesian proportion rising accordingly.We gave China about $41million in Aid last year. (To show them how to make wine and grow dairy cattle to compete with us in the future)No doubt a lot of the cash disappears.Why do we have to contribute in this case, when Indonesia has more than 28 C130’s most of which are not operable because no money has been spent on them.